What is old is new again, I guess. I've used copper before in my wire work, but never really loved it. It can be very soft and the look is somewhat rustic. I tend to prefer a more classic or contemporary look. But, never say never, because on a whim - or perhaps from convenience or financial necessity - I'm not sure which - I purchased some copper wire at the hardware store on Friday. Two simple rolls from the hardware store in the electrical department in 20g and 24g. I knew I had earrings in mind. I can't tell you how happy working with the copper wire has made me this weekend. I liked the first pair of earrings when I made them - but I have to admit I loved them once I darkened them with Liver of Sulfur and tumbled them. They haven't left my ears since! This weekend I made 3 more variations of those earrings - all hoops and all but one in copper. I guess I should get to the point of this post - why am I loving copper and why do I think it's great for beginners? 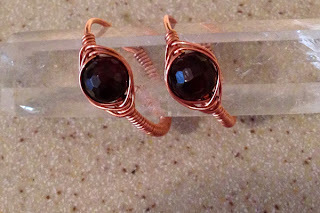 Temper: Copper wire is soft to wrap with - but work hardens easily. It's easy to coil, wrap, hammer - you name it. Cost: Nothing releases your creativity like knowing your mistakes are not costly. Copper is one of the best bargains around. Convenience: Run on down to the hardware store electrical aisle. I picked up 20g and 24g there for $3.99 a roll. Color: Copper is bright and shiny off the roll, but it still works with patinas like Liver of Sulfur - so you can learn wire wrapping and finishing techniques with it. 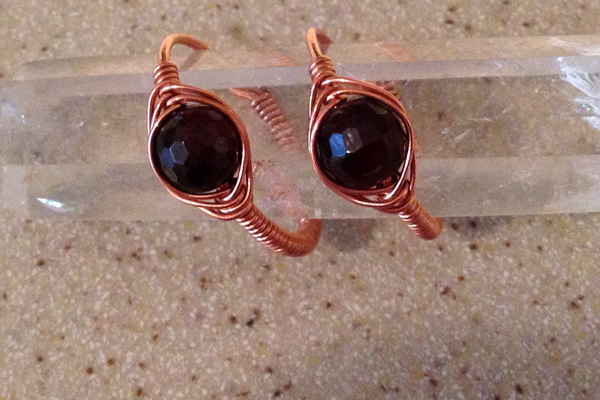 Size: You can easily find copper wire in all of the standard sizes we use in making jewelry. 20g for earwire, 24g or 26g for wrapping beads - even 16g or 18g for making bracelets or sturdier pieces like chains. Variety: Copper is a hardware store staple. You can find copper washers in a variety of sizes that can be used for stamping blanks, for dapping, or as a base for beading or wrapping. I love doming copper pennies. They are the cheapest stamping/dapping copper you can find (pre-1982). I learned to make jewelry with sterling silver since it was cheap at the time (about $12 an ounce I think!). In retrospect, I wish I had known about copper. I learned with half hard wire (mostly) and now working with soft copper is a dream.